A Russian court upheld a decision to transfer former oil tycoon Mikhail Khodorkovsky from a Siberian to a Moscow prison amid a new investigation into theft and money laundering charges against him. 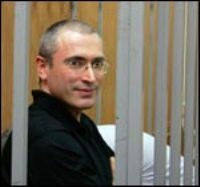 Khodorkovsky, once Russia's richest man, was arrested in 2003 in a tax inquiry that eventually put the oil company he founded, OAO Yukos, into state hands. He was convicted of fraud and tax evasion and has been serving an eight-year sentence in the Siberian province of Chita, about 3,000 miles east of Moscow. In February, prosecutors filed new charges, accusing Khodorkovsky of stealing property worth nearly US$34.3 billion (EUR25.3 billion) from Yukos subsidiaries. The Moscow City Court on Monday rejected an appeal by prosecutors who sought to keep Khodorkovsky in Chita during the new investigation and the ruling was to come into force immediately, said court spokeswoman Anna Usacheva. The ruling also applied to Khodorkovsky's business partner Platon Lebedev, who faces similar charges. "This significantly facilitates the work of the defense team," Yuri Shmidt, a lawyer for Khodorkovsky, told The Associated Press, adding that most of the witnesses and evidence materials were in Moscow. Khodorkovsky has denied the new charges against him as "shameful farce." His legal team has long insisted that the company's business structure was legal and had been meticulously audited by foreign consultants to meet international standards. The trial of Khodorkovsky was widely seen as Kremlin-driven punishment for challenging President Vladimir Putin.